Years ago when I did monthly food crawls highlighting some of LA’s best offerings, my Eastside pizza crawl nearly did me in. It was one of the most memorable and favorite crawls but also put me in a food coma for a few years. Then a couple months ago I was reading one of those top pizza places lists and saw there were so many new pizza places. I nostalgically thought about doing an impromptu crawl but you know what’s better? A pizza party! So the Minty’s Pizza Fest was born. 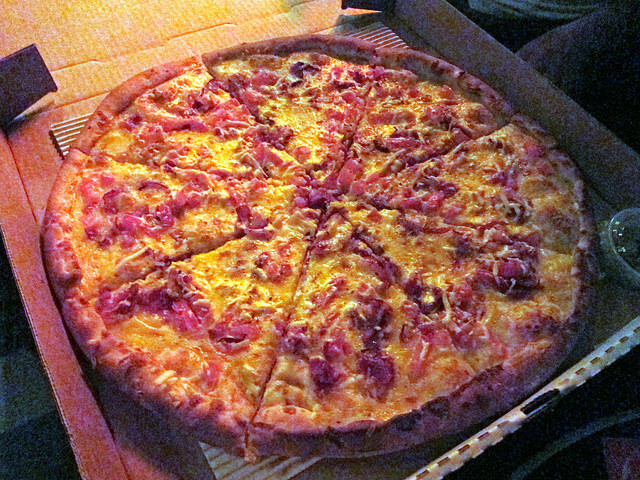 And thanks to the good folks at the Golden Gopher, we had a place to bring in some of LA’s favorite pizza pies. 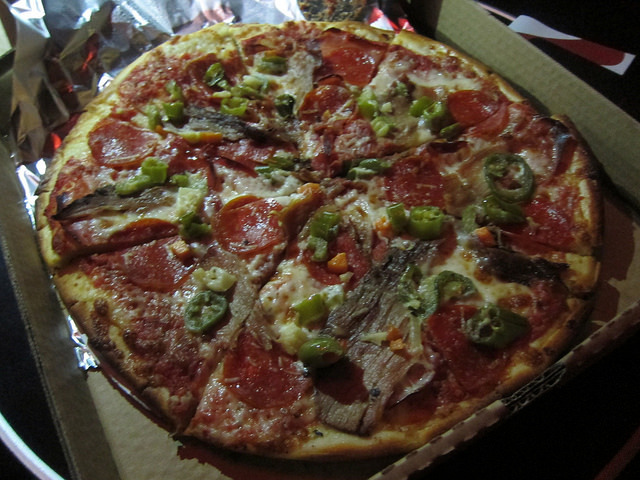 We soon found ourselves with 8 pizzas from Mid-City to Glendale plus a pie from right next door, Pellicola Pizzeria. 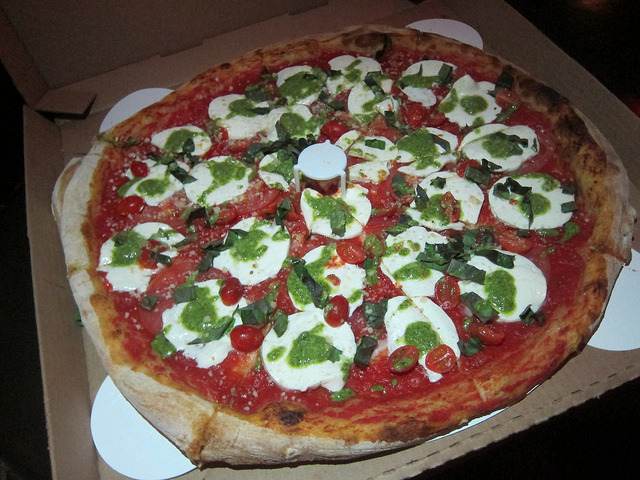 I ordered the Caprese pizza from Pellicola even though it was so tempting to go halfsies of a couple of pies. But I wanted everyone to try one style from each place. I can’t wait for Pellicola to be open for lunch. A slice, salad and perhaps a quickie cocktail next door might be the best weekday lunch. I’ve wanted to order from Hollywood Pies for years. It initially started as delivery only but went on to open a location. Then it closed. But the cry for pizza was overwhelming and they reopened in their current location. The deep dish specialist promised a big taste of Chicago. Now, I do love those thin, extra crispy New York or Italian style pizzas but I love a slice (and only once slice) of deep dish every now and then. I pretty much like any kind of pizza. And since I’m Californian, I do like my “fancy” pizzas too. We tried the Bugsy which is sausage and pepperoni. There’s tons of sauce (seasoned crushed tomatoes) and felt healthier than what you get in the Windy City. The pretty pie was snarfed down in seconds. Admittedly it’s been a few years since I’ve been to Vito’s. I was really happy when Victor and Mary from 2Sense LA brought the classic cheese pie. 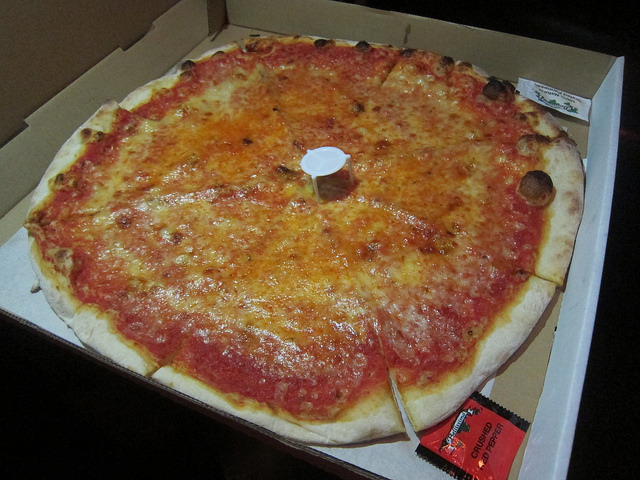 It’s one of my favorite pizzas in the city. Sadly, I thought it didn’t quite survive the trip across town but I would still gladly eat the pizza at the shop anytime. We tried the breakfast pizza from Pizza Boy in Glendale. Initially we were suspicious of the scrambled eggs but it turned out to be a brilliant addition. We will be taking a closer look at this Armenian pizza chain for more. I’m particularly excited they have ajarski khachapuri which is an oval “pizza” that looks sort of like a big calzone. On my Eastside pizza crawl, one of the spots we hit was Tomato Pie. I dearly remember their grandma pie. 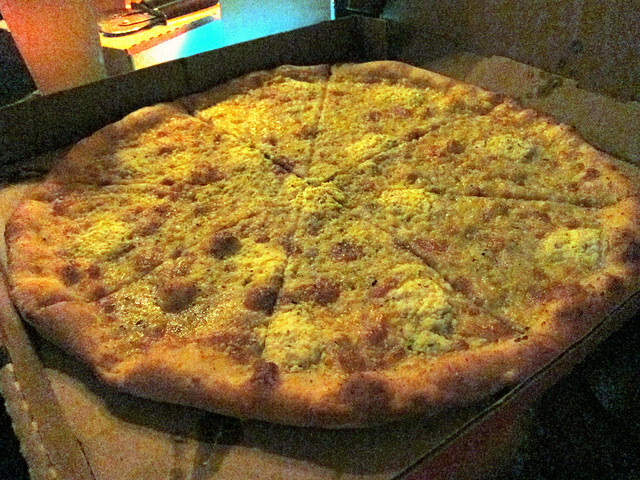 For this pizza fest, we tried a pie called Mr. White with garlic oil and three kinds of cheeses. My lactose sensitive friends and I thought it was worth it to go for it and eat the whole thing. 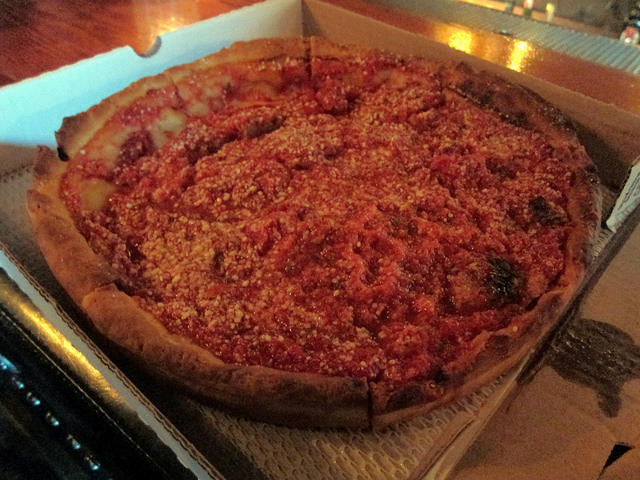 While Masa of Echo Park tends to be known for their deep dish pizza, we tried a regular pizza. The spicy Elysian Park was a meaty rainbow of flavors. Meat lovers would adore this pizza. I’ve been to Maximiliano in Highland Park exactly once but have been meaning to go back. 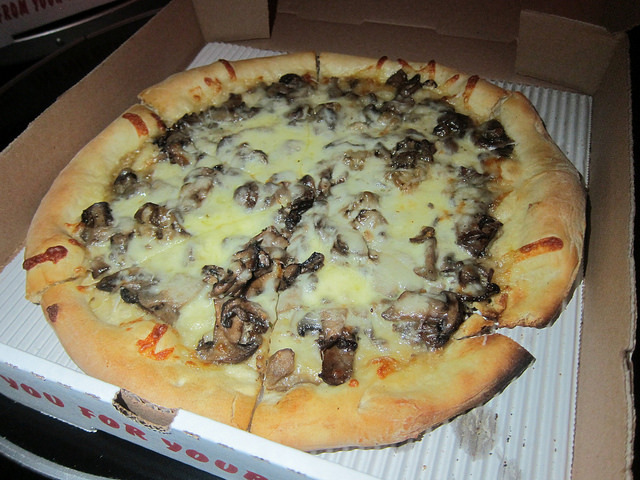 And now that I know they have a wonderful mushroom pizza, I’m excited to try more. 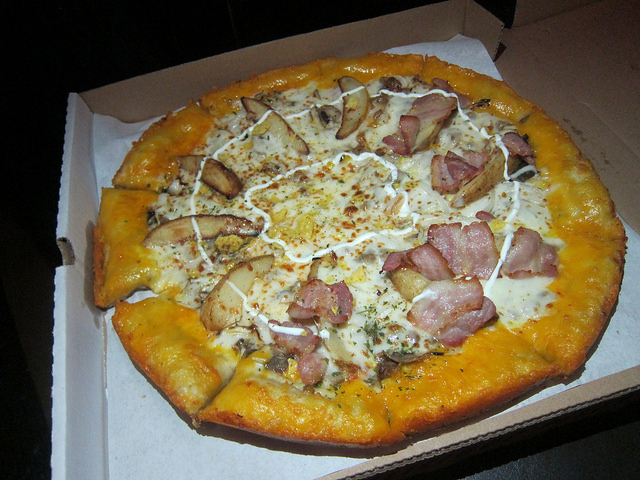 We tried the potato gold pizza from Mr. Pizza. It was a surprise hit. We didn’t expect the crust to be stuffed with sweet potato to be so good. It was almost like pizza and ravioli at the same time. The pizza is topped with potatoes and bacon. 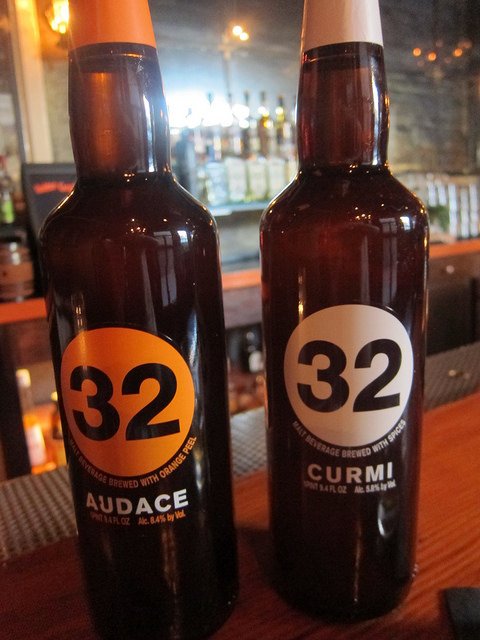 And to wash it all down, we had craft beer from Italy, Via Dei Birrai 32 or Beer 32 in English. The Beer 32 is named after the age of the four founders when they opened their brewery as well as the street address where they are. And 32 is also the number the Italian government refers to beer in the Nice classification system of products and services. Beer 32 is just coming into the LA market. 213 Nightlife bars like the Golden Gopher and Tony’s Saloon are considering it along with Bestia. After we tried all the pizzas, the clear favorite was Pellicola. Getting it delivered from next door probably helped but it was really a good pizza. This was mostly an Eastside-centric pizza fest and now there’s talk of a Westside show down soon. Stay tuned, the Westside Minty may throw a Pizza Fest there!